$500 !! gulp, is that the reservoir ( we Brits call the header tank) or the radiator? You're well served across that side of the pond with new/used parts suppliers ..Google is your friend- no? Any chance you can repair it? They usually go at the seam and I'm sure there's a product out there that can seal that up, even if you have to coat the entire header tank! A friend of mine split one along the seam, opened it up, filled the seam with gipe of some sort and riveted the sucker back together. Gotta be creative/get a parts car/rich to run a 25+ yr old car as a daily, eh? I have a spare here if required. Can we check the obvious too. 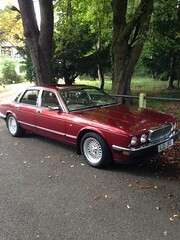 94 “XJ6” could be either an XJ40 or X300! Different tanks of course. Ok so I got the tank for my XJ40. I have one question so I don't over fill the tank. And how come my driver and front passenger vents blow cold. and my rear vents blow hot? I know I'm asking a lot of questions. but The jaguar Service departments are not telling me. they keep saying we have to look at the car and give you an assessment. Only thing is they are more than 100 miles away from me.